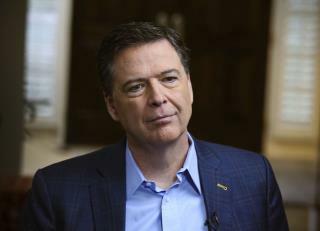 (Newser) – The media blitz along with James Comey's book release is about to begin and America is going to see a whole lot of the fired former FBI director. Comey is doing a string of interviews to push A Higher Loyalty: Truth, Lies, and Leadership, which he wrote after he was fired by President Trump last year. His first appearance is on Sunday, when Comey is slated to sit down for an ABC News interview. The sit-down will also be the first Comey has done since his firing, CNN reports. He'll follow that interview up Thursday when he sits down with CNN's Jake Tapper and then the following week when Anderson Cooper is slated to host a town hall with the former FBI director April 25 at William and Mary, Comey's Williamsburg, Virginia alma mater. We have already notified the College of William & Mary that we will no longer donate as long as Comey has an active association with the College. Hiring him was a poor and premature decision, no matter what the politics. Satire from The Borowitz Report "Melania Says Comey’s Book Not as Mean as the One She Is Writing Speaking to reporters at the White House, she said that she found the tone and contents of James Comey’s memoir disappointingly mild. By Andy Borowitz"
Every time Trump slimes the book, sales go up.